My very first post to this blog was a kind of a summary of corset construction and style in the period 1790-1810. It's awkwardly written, because I was excerpting from a paper and summarizing and wasn't used to blogging like this! It seems like a good time to revisit the topic, now that I've spent even more time analyzing the period. The stays of the early 1790s were essentially those of the 1780s, cut with a higher waist - conical, and heavily or half boned. Very quickly, though, the silhouette changed. Artistic portraits had shown women dressed in flowing draperies, belted high, without stays, and at the same time that those high-waisted flowing draperies entered mainstream fashion, so did softly rounded breasts. While some women achieved this look by not wearing any stays at all, for most, the idea that a boned and laced undergarment was essential to respectability held strong. Non-satirical sources refer to corsets' and stays' existence through this time - for example, a young South Carolinan woman named Constance is described in a travelogue of America (1798-1802) as just developing breasts, but still wearing a "petit corset". A brief period followed in which everyone worked out how to achieve this look with the current stay technology - generally, this was a foundation shaped like ordinary stays made shorter, perhaps a lighter fabric, partially boned or unboned, with some provision for the breasts. This could be a few gussets, or gathered cups. As fashion celebrated an "unbound" body, these didn't extend down to the fleshier posts of the body and exerted minimal control (if any) over the figure. Do not be displeased that I fulfil not your commission for the long stay. Believe, Julia, your slender form, gently and simply rounded by nature, needs not this unnatural compression; they can only be requisite for such females as exceed the embonpoint, to others they give a most ungraceful stiffness; and, I should think, must be as uneasy as they are inelegant and unnatural. Besides, dear Julia, if we consult the painter and the sculpturist, we shall find that the natural beauty of a form consists in a moderate roundness, not in contracted flatness. I positively will not allow of your destroying the symmetry of nature, by the distortions of art. We are justified, my fair friend, in obviating her defects, but not in abusing her gifts. Continue, therefore, your simple corset; and do not, with your plump cheek, and round arms, exhibit the body of a caged skeleton. Thus much, dear Julia, on the subject; but not a letter too much, if it prevents your thinking more of an article never designed for you. This long corset had a wooden busk in front, bust shaping achieved through gussets on either side of the busk, and hips shaped with curved pieces or more gussets. It's tempting to put them in a sequence based on how much of an hourglass figure they have, but one thing I've learned from my sewing is that it's more comfortable for a corset that's tight enough to hold the busk in place to dip in at the waist and flare over the hips, if you have a curvier shape. Even when fashion disregarded a narrow waistline, many individual wearers would have needed their stays to fit one. Additionally, as the stiffening in a corset simply makes the fabric less likely to buckle, rather than making it more restrictive, the presence of cording does not necessarily mean more pressure: my last trial corset was not sufficiently stiffened, and had a tendency to ride up on my hips. It all depends on the needs of the body. Something else that tempts is taking contemporary polemics against tight-lacing at face value. Throughout the 18th and 19th centuries, apart from the short blip in which a more rounded torso was fashionable, moralists and doctors were fixated on condemning women for the vanity of tight-lacing; going by those sources, people often say that women were "freed" during the Regency period and then "re-imprisoned" after it. This or that new invention - metal and bone eyelets, the split busk, etc. - helped women lace tighter. This has developed into a commonly accepted narrative (which must be constantly questioned and refuted by fashion historians) that women faced a greater and greater physical restriction as the nineteenth century drew on, until it at last became too much for women and they rose up en masse to throw their corsets off. 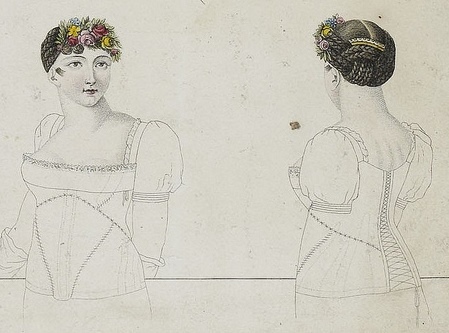 When it comes to dresses, we can use fashion plates and wedding ensembles to get securely dated examples to base our sequences on, but detailed images and "wedding corsets" don't exist in great numbers in the early 19th century. 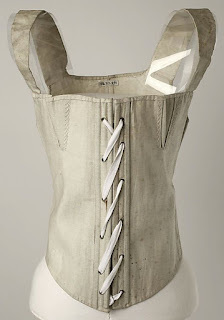 The only wedding corset I'm aware of is this one, held at the Boston Museum of Fine Arts. It is illuminating! For one thing, it shows how misleading a dress form can be when it doesn't fit the corset - the bustline would be much higher if this corset were worn by a person. It does bear out the idea that many parallel lines of cording are a hallmark of later dates, but also doesn't seem to be built for any kind of extreme lacing, though it does have cording focused on the waist. And when it comes to illustrations, corsets all the way through the 1830s show no extra cording or boning and have short gussets that lift the bust high. 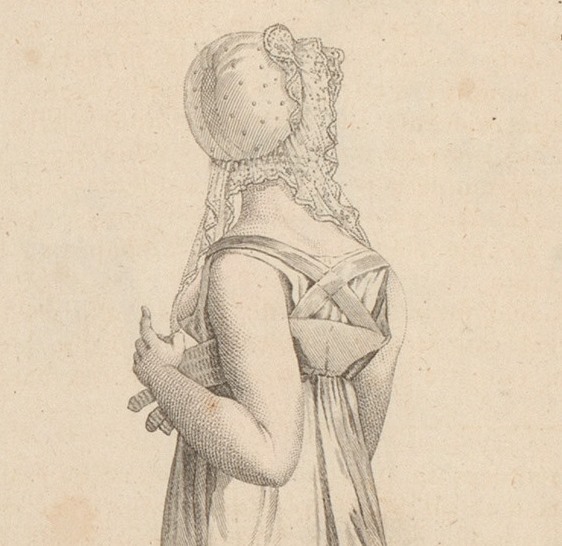 So unfortunately, I cannot do what I set out to do - provide a sequence of construction details that allow you to date extant corsets more precisely - beyond showing that long corsets existed by at least 1807. However, if you give me a few weeks, I will be able to share some more thoughts on corset construction!